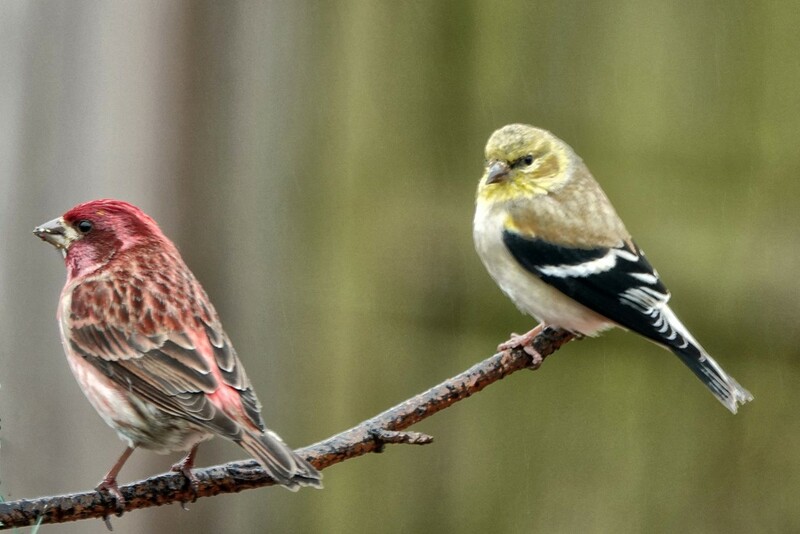 Looked out the kitchen window and the pecan tree was covered in finches - goldfinch, purple finch, house finches - there were well over 50 taking turns going from the tree to the feeder - not always waiting as patiently as these two. Misting all day so no walking with the camera outside. I can't imagine seeing so many finches at once. I'm trying to attract some birds to a new feeder with no luck. I'm envious of your scads of birds! This is a lovely shot with both birds being so colorful. I like your background too, Lanie. 2 1/2 months to go!! How beautiful! What a sight that must have been! Wow, that would have been exciting to see all of them out there. This pair made for a great capture. Nice captured pair and well positioned in the composition. Such pretty birds! Great composition and dof. that must have been a magical sight! Finches with attitude i think?!! I do get a mixture of the Purple Finches and the Goldfinches every now and then- but not 50! That must have been very entertaining to watch. I do love the way they chirp. Good shot! Nice capture of that colorful pair.